(Natural News) Forgetfulness might seem inevitable as we get older, but it can be prevented if you eat certain healthy foods. A new study suggests that eating cucumbers could prevent memory loss associated with aging, thanks to fisetin, a flavonol present in the vegetable. Researchers at the Salk Institute for Biological Studies recently conducted an animal study using mice that were genetically predisposed to display symptoms similar to Alzheimer’s disease. They found that giving these animals a dose of fisetin on a daily basis kept their memories from degrading like they should. The flavonol also works for healthy animals that are not suffering from Alzheimer’s disease. Healthy mice given the plant-based flavonol treatment also displayed an improvement in their ability to remember things. Fisetin can be found in many kinds of fruits and vegetables. Cucumbers and strawberries contain the highest amount of the compound, which studies have shown to be effective at preventing memory loss in mice during animal tests. It activates a cellular pathway that is linked to the way we retrieve memories in the brain. Studies performed more than a decade ago showed that fisetin helps protect the cells of the brain from the harmful effects of aging. Those tests demonstrated that fisetin could prevent inflammation and free radicals from damaging brain cells. Alzheimer’s disease involves both inflammation and oxidative reaction caused by free radicals. As fisetin can inhibit both of these processes, it could potentially benefit older people who are at risk of developing this form of age-related dementia. Conventional treatment of the symptoms of Alzheimer’s disease involves delivering pharmaceutical drugs to break down the amyloid plaques in the brain. However, the findings of the Salk Institute researchers suggest that these protein plaques may not be responsible for the loss of memory attributed to dementia. 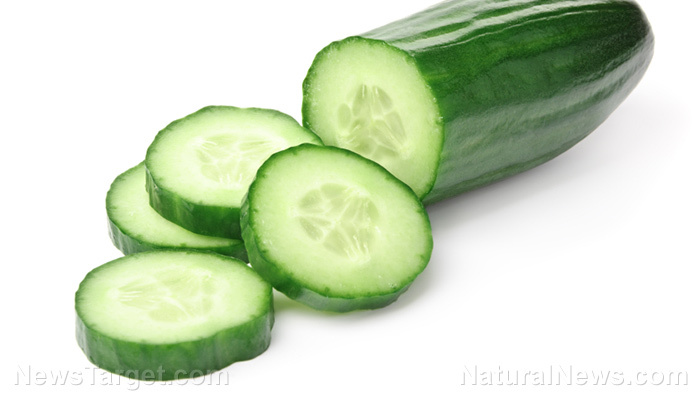 In particular, cucumbers are one of the foods that contain large amounts of fisetin. It can now add “improving the brain and memory” to the long list of health benefits it provides people. Cucumber is not just limited to strengthening memory and heading off the development of Alzheimer’s disease. The fruit offers a plethora of additional nutrients that can improve and support your health. Ninety-five percent of a cucumber’s mass is made up of water. Eating this water-heavy fruit will understandably improve your hydration. It will also help keep your weight down since it contains few calories despite being so heavy on the tummy. A cup of sliced cucumber adds only 16 calories to your diet. The remaining weight of the gourd contain phytochemicals. Cucumbers are known to have flavonoids, lignans, and triterpenes. These phytochemicals can protect your tissues from inflammation, prevent harmful oxidative reactions that damage vulnerable cells, and even inhibit the growth of cancer tumors. The majority of the fruit’s nutrients are concentrated in the peel and the seeds. The seeds have calcium, which is good for the bones and teeth, while the seeds provide fiber that aid digestion. Both parts also contain beta-carotene, an antioxidant and precursor to vitamin A that supports vision. Cucumber also provides magnesium, manganese, potassium, and vitamin C. It is definitely a good addition to your vegetable garden.